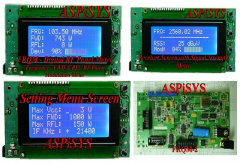 FRQM2 is a frequency counter and multifunction RF meter for panel mounting, which replaces the previous FRQM1 model. It has an attractive 4x20 large LCD display with white characters on blue backlight (see photos and video) and it can be easily fitted on the front panel of your equipment. It counts transmitter and receiver frequency, with optional IF offset of local oscillator, from 10Hz to 2.5GHz. It has inputs for accepting converted (thru a directional coupler, NOT INCLUDED) Forward and Reflected power, signal for Modulation or Deviation as percentage and bargraph, DC Voltage, Signal Stength (dbuV Field-Meter and bargraph), and can show ambient temperature (internal sensor), external temperature (LM35 compatible), depending on the mode of operation and the user defined settings. All inputs are adjustable. All menu settings may be password protected. Display screen and power adjustment may be locked. An option to produce a keyboard adjustable output voltage (0-3.5V DC) for controlling an external PSU for RF power amplifiers is also available. You can also set Forward Power, Reflected Power, and External Temperature limits (cutoff on Hi & restore on Lo) to automatically shut off the controlled PSU when any of the limits is exceeded (ALERT condition), for protection. Adjustable number of attempts and retry interval to recover from a possible ALERT. High quality PCB with double-sided plated thru hole 1.6mm FR4. Operating voltage: 8-15VDC @80mA maximum. 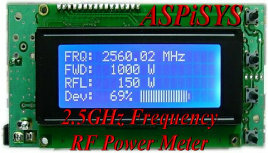 Frequency Range: 10Hz – 2500MHz (2.5GHz) with on-board prescaler. Up to 9.2GHz is possible with appropriate external prescaler and corresponding ‘FRQ Prescaler’ setting. Frequency prescaler: OFF, 2, 4, 8, 16, 32, 64, 128, 256, 512 selectable via settings menu. On-board prescaler: 64, 128, 256 selectable via “jumpers”. Fast frequency gating: 1 second (OFF), ½ second (500msec), ? second (250msec), 1/8 second (125msec), 1/16 second (62.5msec) selectable via settings menu. RX Signal Meter: Linear correlation to input signal, default 25 dBuV to 115 dBuV max (user adjustable from –128 to 127 dBuV via settings menu to match different signals). Temperature display: Approximate degrees in both Celsius & Fahrenheit scales. Firmware update possibility (via optional PC connection). Supply Voltage: 8 - 15V DC @ 80mA max.